I have to head off to bed soon so I was only able to translate this one first-- Nino's director also talked about his segment but I'll try and get that done tomorrow. In the meantime, read on for all the praise for Aiba from the director in charge of his segment on Arashi ni Shiyagare! It's a concept in which he's representing the general public who are unable to take time out of their lives to do their own investigations, and it's more like "he'll try hard to find a solution" rather than "he will solve this problem". It's usually pointless things that ordinary people wouldn't try to investigate, like riding a roller coaster with summer mikans during an investigation to see how summer mikans can become sweeter (laugh), but I think there's always things to discover each time. Aiba-san is very active and able to adapt easily to whatever is needed so I feel like he suits this sort of project very well. We have a lot of room to work with within the general framework of each concept; even though "Aiba Japan" ceased to be a form of investigation somewhere along the way, I feel like it's okay to deviate as long as it's interesting (laugh). The themes for each investigation come from viewer submissions and all of our staff look through them first before deciding on a general basis. A part of it comes from a desire to involve our viewers, so we want to make use of those submissions and succeed at them. However, it can be scary. Like how we had a request to find a time capsule, but we weren't able to find it in the end. That's scary for the creators. We were like, how on earth are we going to turn this into a VTR? But even though we weren't sure how it was going to turn out and we were very uneasy about it, it was also kind of fun to be on edge together without knowing how things would go. The only thing we could do during "Can you draw Baikin-man with germs?" was pray that it would work, after all (laugh). With "Aiba Japan", first of all it was a lot of work to find sports which we might have a shot at winning. And it wasn't just about the big showdown, we wanted to make the team member recruitment exciting as well. Aiba Japan's members end up being really tight-knit, every single time. Irregardless of winning or losing, they become very unified. Within all these people who are very skilled at one thing or other, you have Aiba-san - who one might call the most "ordinary" of the group - being the team captain. But no matter what sort of members are in the group, he's able to get them to open up very quickly and become the heart of the team. It's not that he has excellent leadership skills or that he's particularly friendly, yet he just naturally takes on the role of the captain within these gatherings of all these people who are skilled craftsmen in their own ways. Being able to become the central point around whom everyone gathers before we all knew it is something Aiba-san is able to do precisely because it's him, I think. The location shoot that left the deepest impression on me would be the hole digging showdown with Aiba Japan. It aired in October but the filming took place in the middle of summer. Everyone present at the scene were really animated and moved by the way he was practically digging for his life. Aiba Japan always starts off half-joking at first, but once they get going it seems like they become serious about wanting to win, and it always turns into something touching by the end. Perhaps a huge part of that is due to the fact that Aiba-san is at the heart of it all. Aiba-san remembers all of the staff by name. After the location shoot for "Arashi Ryokan" which aired on New Year Day, everyone shared the leftover drinks and reflected on the past year together. Then, the topic shifted to one of the ADs who had been transferred to another TV program. Aiba-san asked, "How is that person doing now? Let's get in touch with them!" and then used my cellphone to talk to them, asking things like "Are you working hard?". That person was extremely happy about it too. He really does pay close attention to the staff and would say things to us, such as "You're always running around carrying those heavy things". To us, Aiba-san has a charismatic presence. 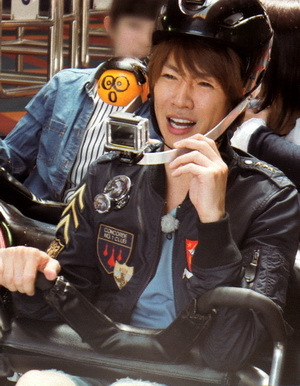 And because we know that Aiba-san is paying attention to us, all of us are very proactive about our work as a result. I feel like the staff for "Delegate Investigations" is like a team in itself, another Aiba Japan where we are under Captain Aiba's lead. In terms of our future objectives, above all else I would like Aiba Japan to win something. Once they notch a win, it would be nice if we can form a new Aiba Japan with Aiba-san as the captain that can help out viewers with their problems. They have a can stacking competition coming up on February 20th (tentative), and we're talking about how we want to go all out for the win. Aside from that, I would like us to find one of those time capsules since we have quite a few time capsule requests from our viewers. We weren't able to find any a while ago and Aiba-san was frustrated about it too, so I hope we will be able to actually find one someday. Aiba is such a sweet person :) Thank you for this! Aiba is a people's person after all...it is really amazing he can remember all staff names even the one who already got transferred..
Cant wait for nino's part.. Thanks for the translation. He's such a sweetie. Aiba-chan's so sweet <3 They always have nice things to say about him. <333333333 Our Aiba is such an angel and an all around sunshine!!! Thanks so much!!! Thanks for the translation, it's a very sweet side of Aiba from someone else's viewpoint.